From the Sanskrit himalayah, literally "abode of snow," from hima "snow" + alaya "abode." Himalayas: Mountain range in Asia, extending east through Pakistan, India, China (Tibet), Nepal, and Bhutan. Also home to yaks. The domestic yak (Bos grunniens) is a long-haired domesticated bovid found throughout the Himalaya region of southern Central Asia, the Tibetan Plateau and as far north as Mongolia and Russia. Yak wool is derived from the coat of yaks, a herd animal that is found in the mountainous regions of Central Asia. Yaks have long shaggy hair and a dense woolly undercoat. It is this soft fine under hair that is most desirable for manufacturing, and is removed by de-hairing. So for my third scarf in the series, I chose a 55% silk and 45% yak blend (7600 yds/ lb). My skein label from the current Treenway management says its a 30/2 but my trusty silk chart from the older incarnation of Treenway says its a 32/2 and I would agree. Its much finer. So this scarf is slightly weft faced but its just fine, because its fine. I had a fully loaded pirn of it after my recent shawl project so I gave it a test try and liked it against the black silk. It means the pattern is smaller and tighter. Nice crisp definition. It makes working with finer threads so worthwhile ! It does add up to a lot more treadling but you get into the rhythm of it and it just adds up. 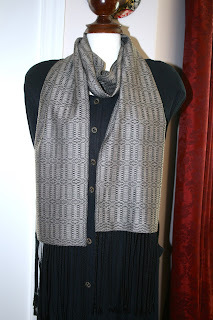 Weaving with fine threads is just the same as working with 8/2 or larger.... there's just more to each step. Would you like to try finer threads? 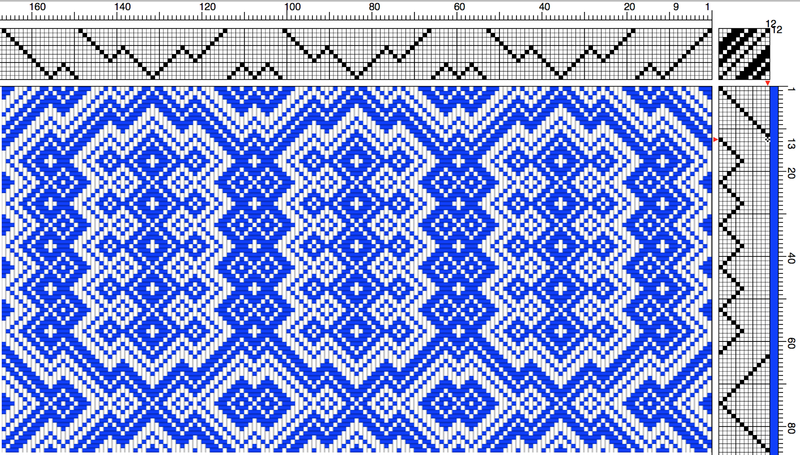 Work your way down by progressively using finer .... say if you are used to 8/2 (at 18 for lace, 20 for plain weave and 24 for twills) , then try 10/2 next time (20 for lace, 24 for plain weave, and 28 for twills)....then shift to 16/2 for some finer weight kitchen towels perhaps? 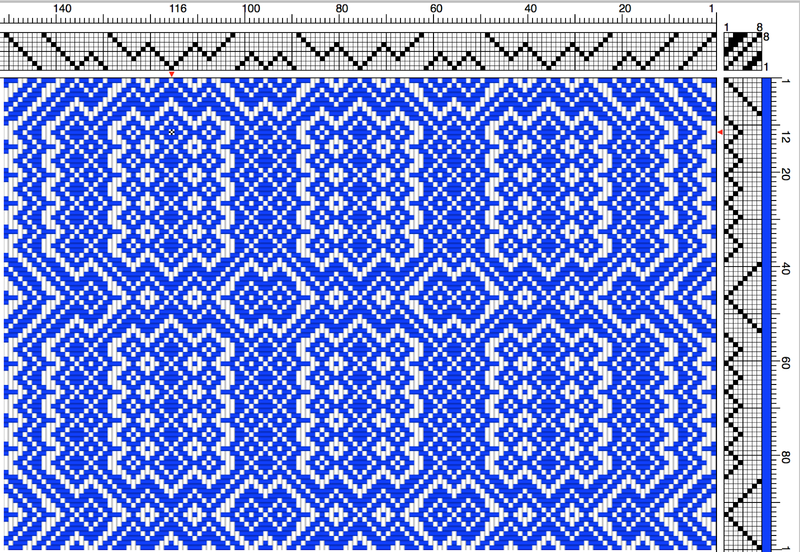 (24 for lace, 30 for plain weave, 36 for twills). All the other steps remain the same; just take your time and work through slowly each step. 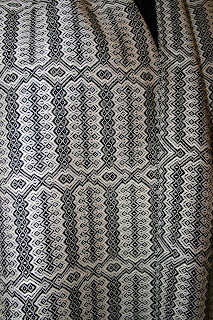 The black silk most likely was originally from either India (visit the Indian Government Silk Board link), or China. I have heard many weavers say that they are "saving their silk stash for later". That they feel they aren't up to the task. In short, silk intimidates them. Well, no one warned me I should be nervous and with the enthusiasm that comes with being a newbie I started weaving with silk about a year into my early weaving days. Its actually quite strong on the loom and handles the tension well. Its not a fan of abrasion but not many yarns are so be sure to beam well and allow for draw in, or use a temple. 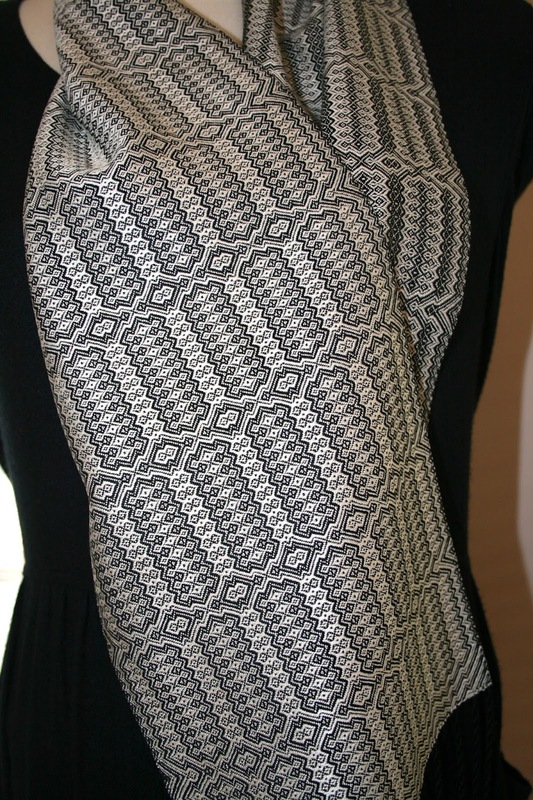 This picture above show both sides of the scarf. It measures 8 inches by 74 inches plus fringe. This time I twisted three fringe groups to produce a rounder cord. It washed and pressed up beautifully and looks quite elegant. It will be a nice statement against a black top coat. I added it to my Etsy shop and it sat for almost a week and then suddenly it was sold. The buyer is my client who commissioned me to weave the other two silk scarves! I can't blame her though because if she is to give the other two away as gifts, then its nice to have one of her own. So its ready to be shipped off today and so come to a journey's conclusion..... after all the Himalayan region is quite the start in life..... and its will finally land and live in "Weaverville". I just love that name! 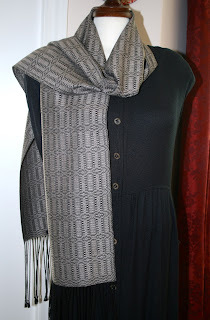 I have become friends with my client through this year of weaving together and we have had some nice phone chats. She specializes in spinning and weaving exotic luxury fibres such as Arctic Musk Ox Qiviut which is becoming rare and hard to find. Its essentially a Musk Ox's fine under coat that it naturally sheds each spring. Hhmm, isn't that what yak fibre is? In our house, especially with a dog, we have always called the finer undercoat of any critter their "underwear". 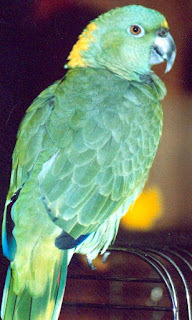 This goes way back to the days when we had a parrot named Ronnie and she would preen her feathers and drop all these little white fluffy bits all over the floor. We would tell her to stop throwing her underwear on the floor. Well, it seems we were right after reading the definition of qiviut... it also referred to bird's feathers as well as the musk ox. How about that? 😳 we honestly didn't know that ! Ronnie- a double yellow napped Amazon parrot, and yes she could talk! 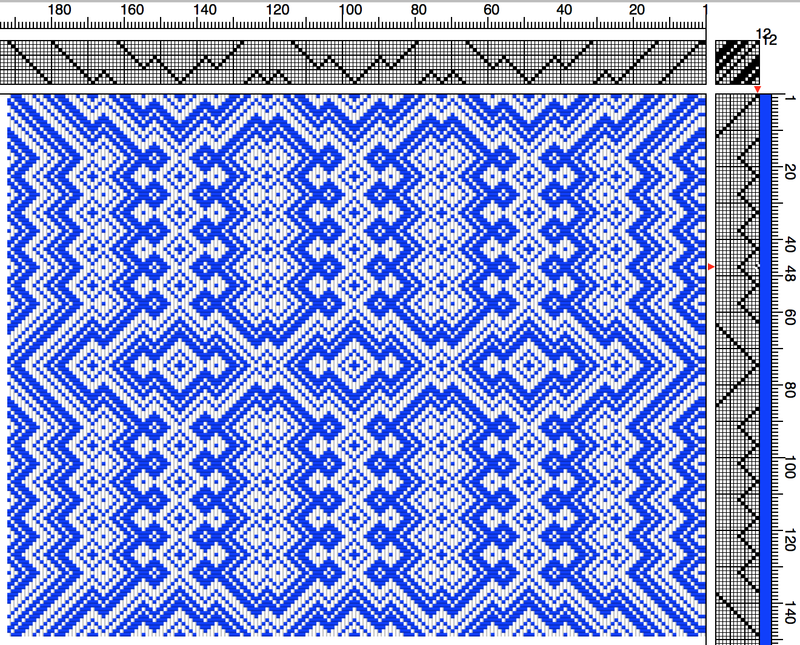 We are also going to lean a bit hard on my Fiberworks weaving software. I use the Silver Plus version as I have a Megado loom to run but the Bronze level will do just fine. 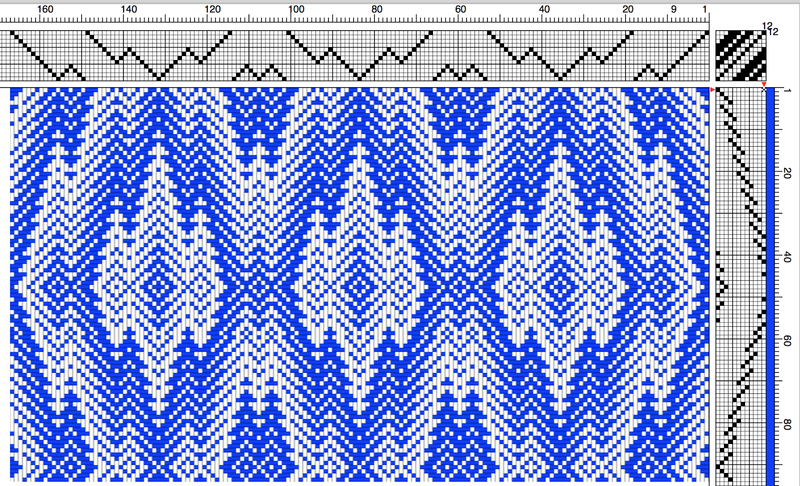 It can also be any weaving program that you have to hand if you decide to play with a draft and tie up as we will today. No program? no problem! I recommend downloading the Fiberworks Bronze and it will act as a free demo. You can do everything except save and print. Back in the summer of 1996 I bought my first loom and brought it home. It was a 'new to me' four shaft Leclerc Colonial jack loom. (It could be either jack or counterbalance). My friend and weaving mentor Margaret lived nearby and came over to view the new baby. She saw I had it threaded for an overshot pattern from Deborah Chandler's Learning to Weave and she sat down to throw the shuttle and see the looms action and shed. I was a brand new weaver and very much a 'recipe' weaver at that stage of things. I would take all aspects of the project right off the paper or magazine and follow the instructions closely. Understanding the draft and how the interlacement of the threads worked was a long ways off for me at that point in time! But I still recall watching Margaret joyfully throwing the shuttle and change treadlings on the fly. Each new 'dance' produced such a different look, and this was my first clue that I had a lot to learn! She was dancing on the treadles and having such a grand time seeing what she could come up with, even laughing as she made a mistake and unwove...(heck, it had looked good to me!) It created a lasting impression for me. I had to get better at getting more from drafts and tie up's due to health reasons. 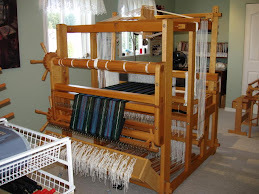 I was unable to get under the loom to change tie up's without hurting my joints or lower back. After three joint replacement surgeries parts of me simply do not bend or move the way they used to anymore. I shifted to lifting my Spring 90 loom up onto crates and sitting on a stool, which while much better, is still an effort.... especially a full twelve shaft tie up of 144 cords! So why not make it count? Plan a series of scarves....then put on another warp and weave towels.... and then maybe some quick book marks as gifts? The threading can remain the same (or change it if you like * more on this later) , the tie up is all done. 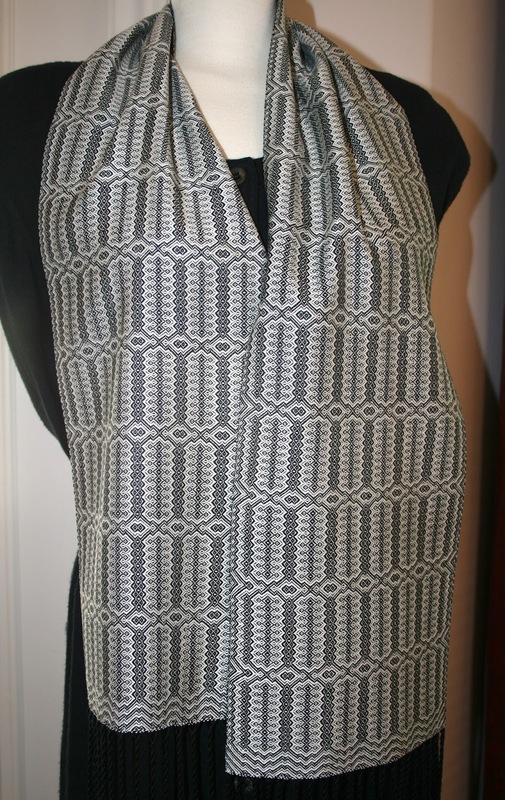 Simply choose a different way to treadle it and get a new project with a new look. I had enough warp leftover after the three silk scarves were done and so I was able to weave more than just a basic sample for my records , but a few variations too. Sample number one is at the bottom and number 4 is at the top. All are on the same threading and tie up as shown at the beginning of this post and the only thing that has changed is how I treadled it. Not all drafts will be suitable for this method, but many are, such as twills. That's where the weaving software comes in handy and saves you much time and effort. Add in your chosen threading and tie up and then play with different treadlings and see what you can come up with! 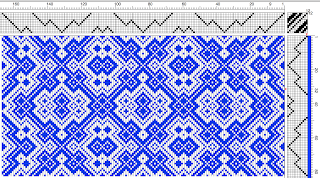 If you own the software you can also check float lengths, view the back of the cloth to see if its reversible. You can click 'save' on the threading and tie up and then add and erase treadlings without having to re-enter the basic data over and over. 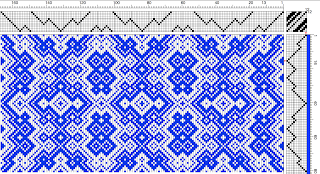 The program will allow you to add tabby and remove tabby, weave as network, as drawn in, flip and reverse the sequence and so on and so on. 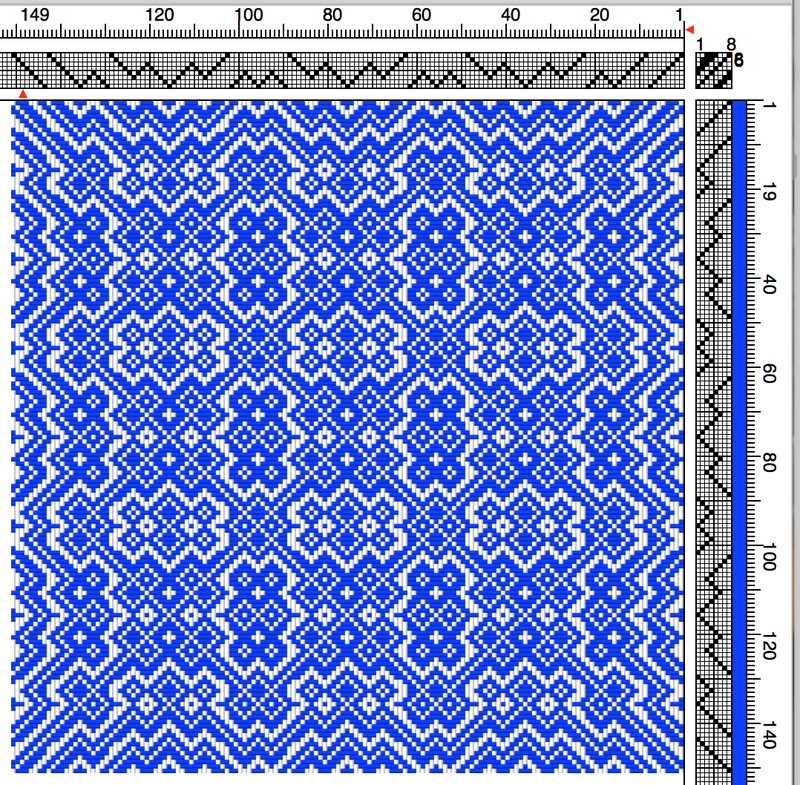 ... and below is the draft showing the pattern above and you can see how the treadling was achieved. 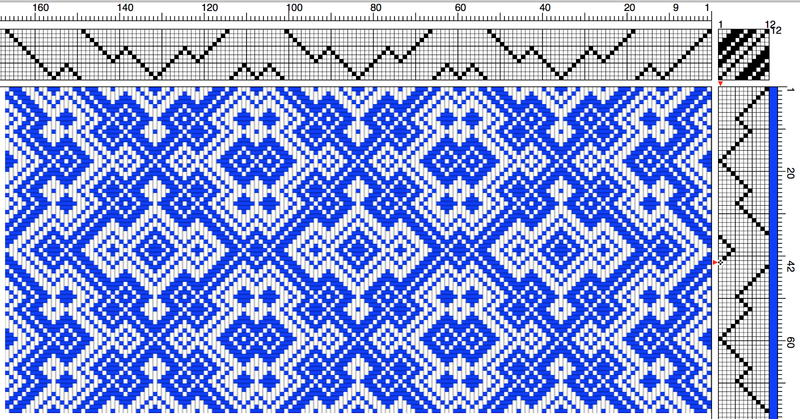 The section showing the treadling of twelve to seven and back again can be done as many times as you like. 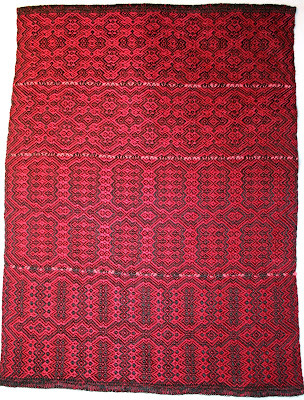 I wove thirteen repeats on the red scarf simply because that length looked good to me. You could weave it the entire length is you liked! 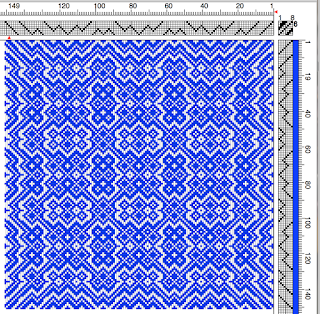 Below is one of the recent table runners woven this way. 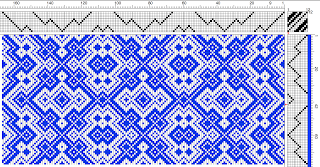 10/2 mercerized cotton warp and weft, sett 28 epi. 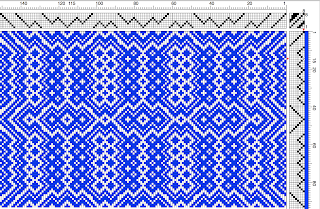 I tried paring things down to one repeat of each motif and it produced a neat and tidy, almost tight, groupings. Nice... very ornate! 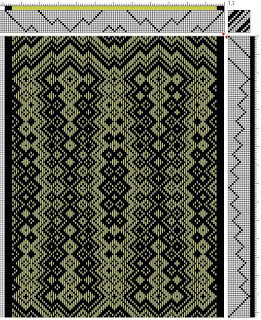 Now I have run out of woven samples to show you, but we still have our drafts to play with. 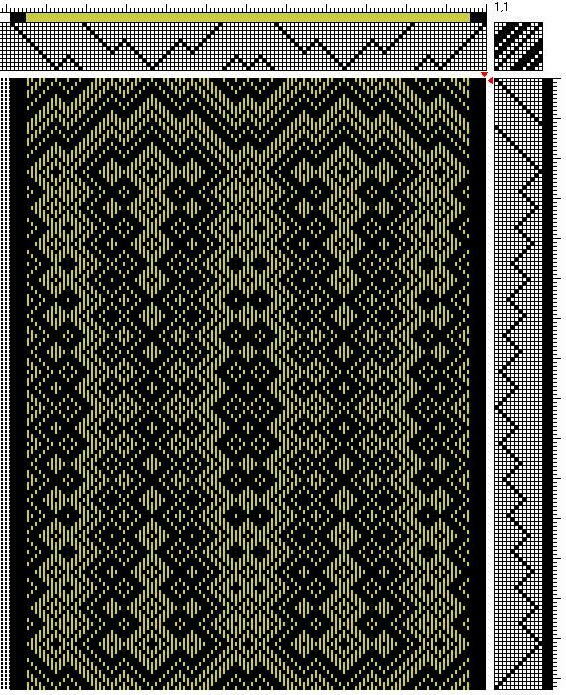 So the first one is our same trusty twelve shaft threading and tie up, but this time I used the classic twill progression used in many snowflake twill drafts. Now we have some drama! 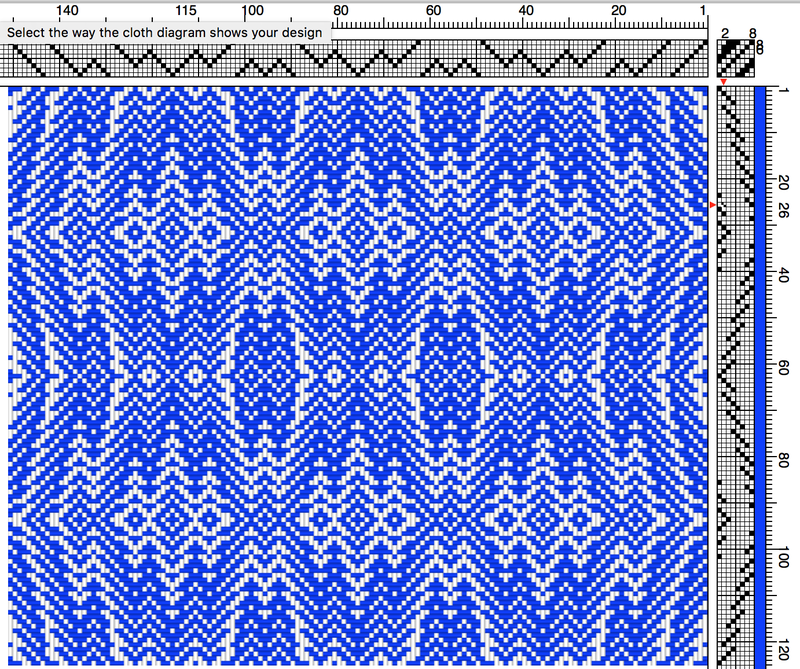 (Reverse the twill progression and it will look like an exaggerated large 'X'). Again, add some point twills or straight runs.... or both in between. How would that change things? 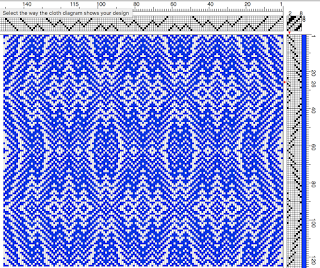 How about a (seemingly) endless twill run back and forth? Now that's pretty. Now some of you might remember seeing an asterisk * further back in the post.... I'll forgive you if you missed it or forgot! If you were to decide to try weaving a series of scarves, towels or runners using the same tie up and threading, but after a warp or two you decide you are getting bored, or its not for you, then consider leaving just the tie up in place and using an entirely different threading. If you completely weave off one warp and plan to beam on another using the same tie up.... you could take the opportunity to change up the threading at this time too. 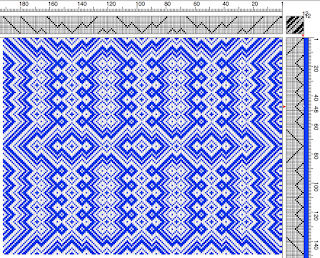 Simply play with your weaving program and this time change the threading and treadling variations. 😳 Its a whole new deck of cards to play with! If you'd like to make a change with an existing warp on the loom: make the best plain shed you can with the current threading and slide in lease sticks *behind the reed and shafts*. Support in place with cords. Cut off the cloth in front of the reed. 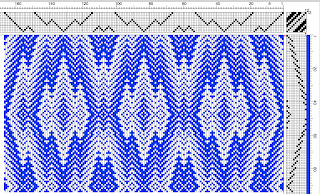 Pull the warp back from the reed, and heddles. Re thread taking the warp ends in order as closely as you can from the lease sticks. 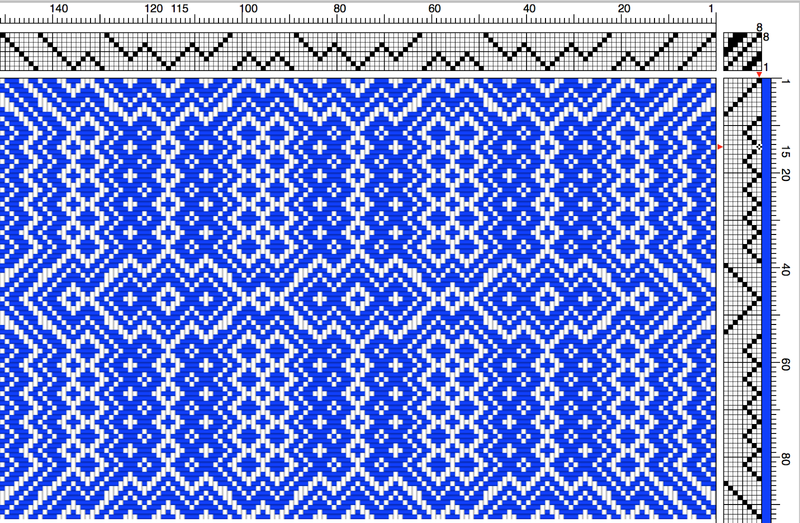 Threads can be slightly out of sequence back here, but not from the heddles forward. Sley the reed, tie on or lace on and you are back in business again. I hope I have given you something to consider, some inspiration to try something new while leaving something old in place. It really doesn't matter how many shafts you have as switching up the draft can be done as part of the design and planning phase for any loom. 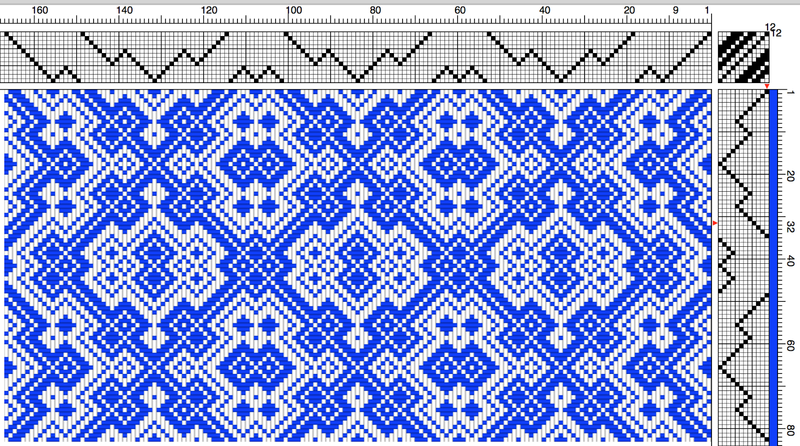 Perhaps this will also help you to become more comfortable with your existing weaving program.... or to try a free download as a demo and give this some computer play time. Oh, and be warned, its addictive! You start hanging out at places like Handweaving.net cruising for drafts (and develop shaft envy.) 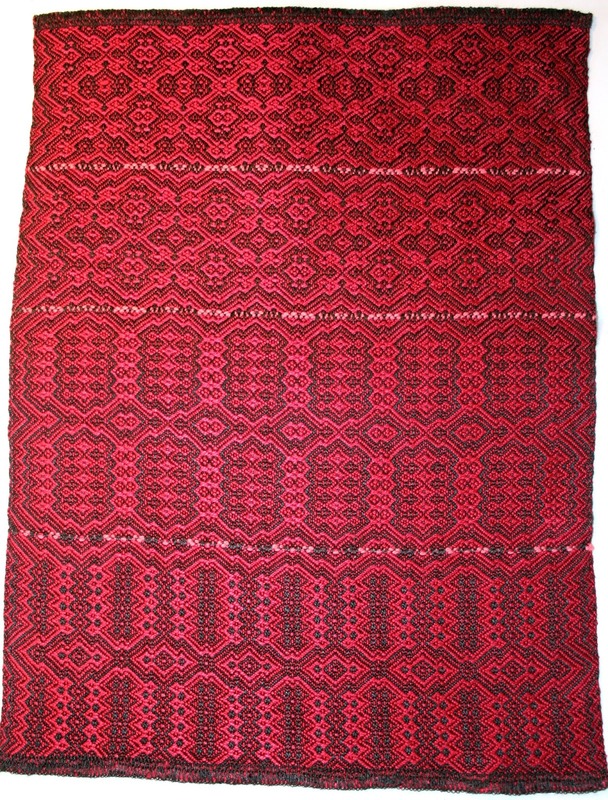 I have talked with some weavers who create a new draft and then say they like to weave about two inches on the loom to see what it will look like and they are ready to move on to the next design they can come up with! If you made it this far, thank you for hanging in there. If you like the possibilities playing creates, you can also see this older post from October 2011 where I wove three scarves, three different ways. 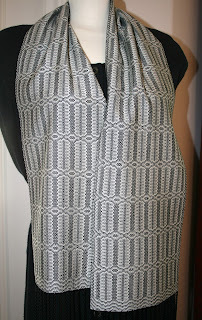 This past late spring I was thrilled to be asked to weave two all silk scarves for a client! She was very particular about what she wanted as far as pattern, colours and fibre which is great. She had purchased one of my linen / cotton book marks a few years ago and loved the intricate twelve shaft pattern. 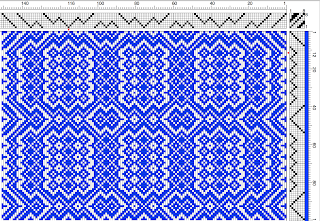 yes, this is the same draft as the scarves! As I had some projects under way on the loom and another special order to go so I had time to order in the silks. 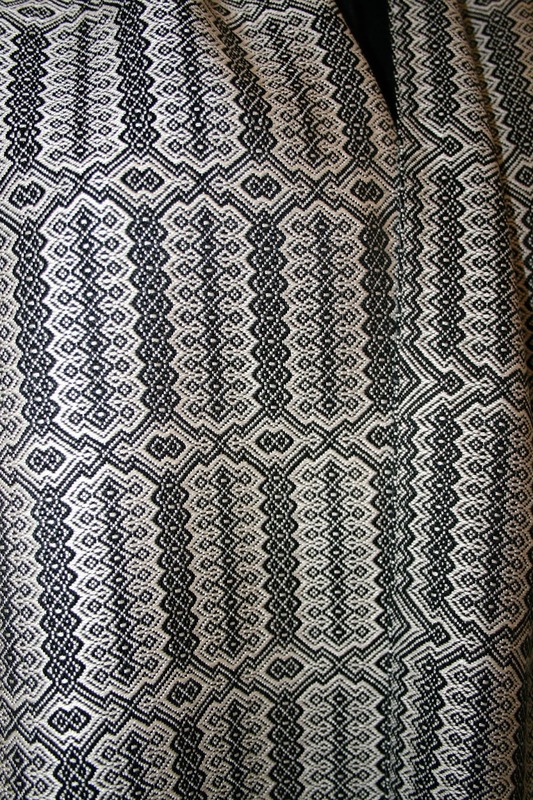 The black 30/2 silk came to me via a friend in California who had done a bulk buy. She has a modern jacquard loom and it eats yarn like crazy! It arrived and looked wonderful! Meanwhile I found some lovely red 30/2 silk from a Canadian supplier. When it arrived it was decidedly an orange based red and not the requested blue based red. It had looked just right on the screen... and of course, all screens are different. Nothing replaces a real sample and I had clearly overlooked that fact, even though I often tell you just that. My Bad. So my client found what she envisioned as the perfect colour and sent me a link to Treenway Silks and their dye number 42 "Velvet Opera". Oh, yeah! Rich, deep and lush.... and rather burgundy compared to the other reds in the lineup. So I ordered 30/2 silk, dyed to number 42 and waited for my order. I was thrilled when it arrived as the colour was simply beautiful! Then I noticed it. It was not 30/2 silk. It was 60/2 . I last ordered bombyx silk from Treenway under the old ownership and when it was here on the west coast on Saltspring Island. They called their yarns by their actual type of silk and the size of the grist. The new owners have given all the various yarns names, which is lovely, but apparently confusing to me when I ordered. I called and spoke to Susan at Treenway and asked if a rush order could be done on 30/2 silk and in number 42 Velvet Opera? After hearing my story she kindly offered to take back the finer silk but I declined as firstly, it was my mistake, and secondly... I love the colour! Susan drove some silk over to her dyer who did it right away ( and was about to go away on holiday for a month... talk about cutting that one close! ). It arrived quickly and it was perfect! So runs of bad luck usually runs in threes. I started to wind my warp and it was going well. I had about 50 ends wound when I started to notice little bits of black dyed 'fluff' stuck to the smooth yarn. They picked off easily enough and I carried on.... but they started to increase and within a yard or two the yarn was covered in little bits. While they picked off okay and in time would wash out of a fabric, it was not the smooth silky look I wanted for this project. These are going to New York City! The only other yarn used was a natural off white bombyx silk, also a fine 30/2 and I'm happy to say, problem free! From that point on there were no more issues to deal with. The beaming of the warp went well, threading was straight forward and no mistakes, no sleying errors and after lacing on, the warp tension was great! It was just a lot of weaving as the yarns are so fine! I listened to podcasts as I wove and mostly CBC's Quirks and Quarks, a science program. 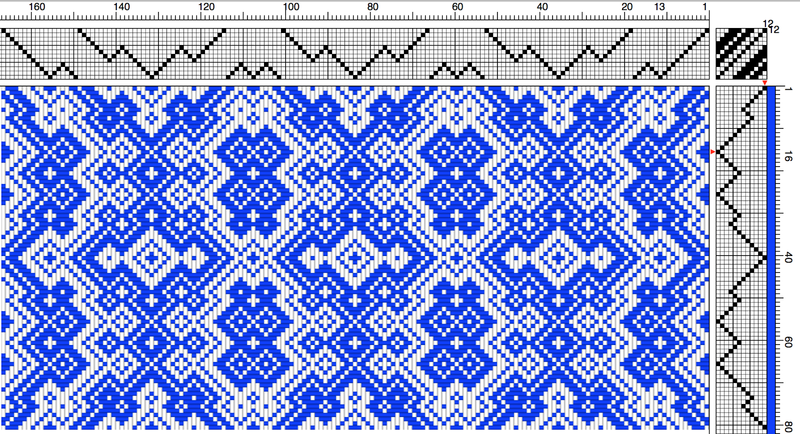 There are several ways to treadle this pattern but I used two of them by the client's request. Next post I'll discuss the various options and show you how they look. It also took a bit longer due to Life happening (Calli's surgery) and summer in general (gardens and getting out more). 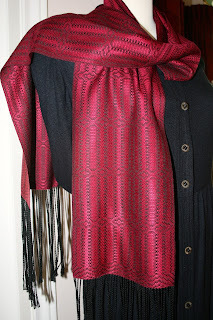 Then, they were done and I cut them off, leaving a third silk scarf on the loom for later. 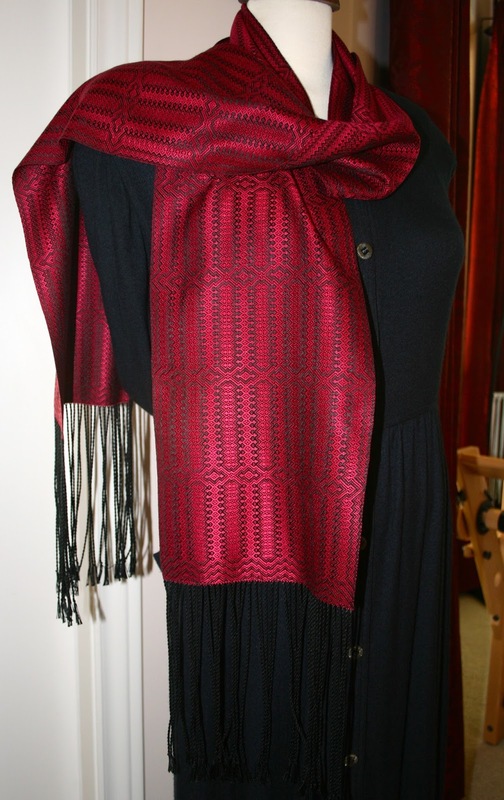 The lady's scarf: I twisted a finer fringe this time and made it seven inches in length. The gent's scarf: was a more regular sized twist bouts and cut to four inches in length. Time to hand wash them! I had a feeling that washing the scarves separately would be best and it would seem my intuition was right! The dye job was a rushed order and so perhaps was not rinsed till clear. I did several rinses and used a drop of synthrapol to help but this scarf will have to go with a warning to handwash separately. As you can see from the pictures below, the black really wasn't an issue with minimal bleeding. There was no greying of the white silk at all. A good hard pressing with my trusty steam iron and out popped that lovely glow that only silk has! 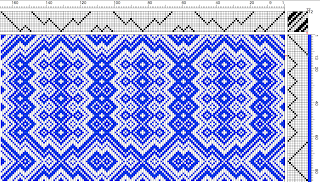 Picture above and below how both sides of the scarf. one side is a bit darker, the other a bit lighter. These two final pictures are my favourites as they really give you a good idea of how lush this colour is! I think my client is going to be very happy once she opens her parcel. I know it was hard to part with it myself. Meanwhile back at the loom, I laced up the warp again and checked my stash for options. I found a full pirn of fine silk yak blend left over from a recent shawl project. It made sense to me as since I wasn't entirely sure of how much warp I had left. If it was a bit short, then it could be a man's scarf and if my luck held, then a full length lady's scarf.... plus my pirn would be empty and back in use again! The colour is also nicely neutral too. Sorry for the slightly fuzzy focus picture but it does give you an idea of how things are progressing. In a word: slowly. It seemed like I'm treadling a lot for little gain so I set a fine coloured cotton thread into a shed and wove for an inch. Using my trusty pick glass I counted forty six picks per inch! Well no wonder it's a lot of work..... Its labelled 30/2 but it looks and feels much finer than the bombyx 30/2 I just used. So my next post will be a follow up from this project on treadling variations and how you get more bang for your buck out of a tie up and threading! Calli report: she's doing just fine and had her stitches out this past Thursday. Its healed very well and the nasty onesie has been washed and put away. She will need to see her vet in six months time for a check up.